Ecom Express Grew Its Revenues 200 Times in Just 2 years! Astronomical growth in the e-commerce sector in India in the past 5 years or so, has led to the birth and steep rise of ‘e-commerce focused logistics’ segment. Companies in this segment are attracting tremendous investor attention. The e-commerce industry in India is poised to grow further and penetrate deeper into Tier-II and Tier-III cities, which will definitely pave a path of high growth for the ‘e-commerce focused logistics’ segment. Ecom Express is one of the key players in this segment. Ecom Express Private Limited, which owns and operates Ecom Express, is a logistics solution provider which caters solely to e-commerce logistics. It was co-founded by T. A. Krishnan, Sanjeev Saxena, K. Satyanarayana and Manju Dhawan in 2012. The company specializes in pre-paid, cash on delivery, cash before delivery, drop-shipping and reverse logistics services. It also provides value added services like same day delivery, special delivery location, Sunday pickup/delivery service to its customers. The major e-sellers using its platform include Amazon, Flipkart, Snapdeal and Myntra. In just a span of three years, Ecom Express’ revenue figures have grown 200 times from INR 73 lacs in FY 12-13 to INR 151 crores in FY 14-15 (refer to the chart below). However, it has reported a loss of INR 49 crores in FY 14-15. Company’s expenses seem to be split across two major heads – Employee expenses and Cost of freight. While employee expenses almost quadrupled from the previous fiscal, cost of freight became five times. Ecom’s major competitors include Delhivery, GoJavas, DotZot, among others. As per various news articles, Delhivery, based in Gurgaon, had raised Series D funding of $85 million from Tiger Global Management, this year and GoJavas raised $20 million from Snapdeal in October. 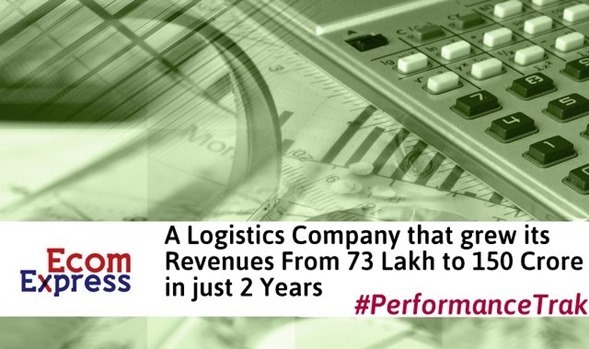 As per the documents obtained from the Registrar of Companies, Ecom Express had raised INR 280 crores (nearly $45 million) in June this year from Warburg Pincus (a much higher number was floating around in news article). They had raised an earlier round of INR 80 crores from Peepul Capital in August, 2014. The company aims to use these funds to expand to 450 cities across India by March 2016. The E-commerce industry in India is still in its initial phase with major players like Amazon and Flipkart registering double digit growth year-on-year. Logistics, being an allied industry, is also expected to grow in tandem, in coming years. In turn, these players will also determine the success of e-commerce players by coming up with innovative solutions to cater to Tier-II and III cities. "Ecom Express: A Logistics Startup That Grew Its Revenue from INR 73 lakh to 150 Crores in Just 2 years", 5 out of 5 based on 4 ratings.